Binder containing 698 slides/transparencies (35mm) of entertainers, celebrities, singers and sports stars (usually multiples of each subject) from the 1970s and early 1980s, made by noted celebrity photographer Richard Bocklet. Images are candids made at Academy Awards nights, movie premieres, openings, parties, dance galas and other social gatherings. Looking at these you can almost feel the paparazzi cameras flashing. 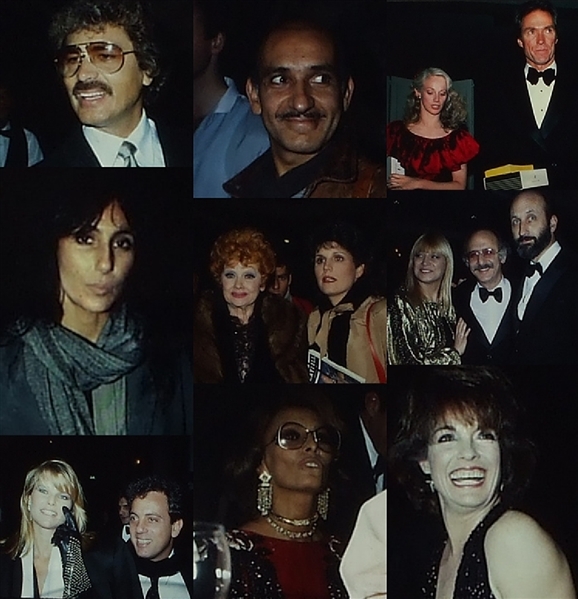 Images include Sophia Loren, Lucille Ball, Lucie Arnaz, Nancy Allen, Linda Carter, Cher (many), Clint Eastwood, Sondra Locke, Hal Linden, Morgan Fairchild (many), John Forsythe, Linda Gray (many), Bob Mackie, Larry Hagman, Yazmin Kahn, Veronica Hamil, Hill Street Blues stars, Rex Harrison, Englebert Humperdinck, Julio Iglesias, Placido Domingo, Jesse Jackson (many), Ben Kingsley, Billy Joel and Christy Brinkley (many), Donna Mills, Peter, Paul and Mary. Liv Ullman.